When searching for high-quality hose connections, look no further than Jacob UK. As one of the leaders in the UK for superior pipework systems and components, they have a large mass production and high capacity warehouse, laser welding systems and advanced in-house tooling. 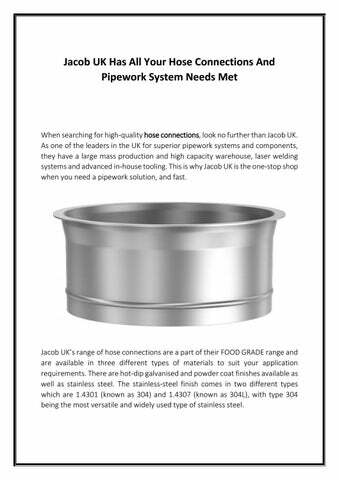 This is why Jacob UK is the one-stop shop when you need a pipework solution, and fast. Jacob UKâ&#x20AC;&#x2122;s range of hose connections are a part of their FOOD GRADE range and are available in three different types of materials to suit your application requirements. There are hot-dip galvanised and powder coat finishes available as well as stainless steel. The stainless-steel finish comes in two different types which are 1.4301 (known as 304) and 1.4307 (known as 304L), with type 304 being the most versatile and widely used type of stainless steel. Jacob UK’s FOOD GRADE range uses stainless steel that meets the high standards of the European regulation EC 1935/2004 and the FDA (Food and Drug Administration) requirements. Their range of hose connections have a variety of DN (Diameter Nominal) to choose from which range from 50 up to 315, and also come in a thickness size available in 1mm. Their range of hose connections also has additional flexible sleeves available as well. Their flexible sleeves are made from EPDM (Ethylene Propylene Diene Monomer) rubber material and are available in black. Their EPDM rubber features a low electrical resistance, making it electrostatically conductive. It has a temperature resistance that can withstand temperatures ranging from 120°C down to 30°C, although additional pressure resistance can be requested depending on your application needs. Apart from their range of hose connections, Jacob UK also features a range of various hose accessories such as their hose plugs, hose clamps, hose sockets and much more. 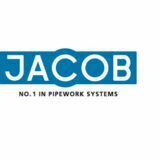 When you need quick, efficient and superior pipework systems, components and accessories, Jacob UK is the number one choice for business across the UK. For more information on their pipework system range, as well as to browse their entire range, visit their website today to get started.